SOLBIATE OLONA (VA) 26 MARCH 2014 - NRDC-ITA staff explored new security dimensions with a seminar that focused on NATO transformation and cyber security, in Exercise EAGLE EYE, held at “Ugo Mara” barracks in Solbiate Olona, 26 March 2014. 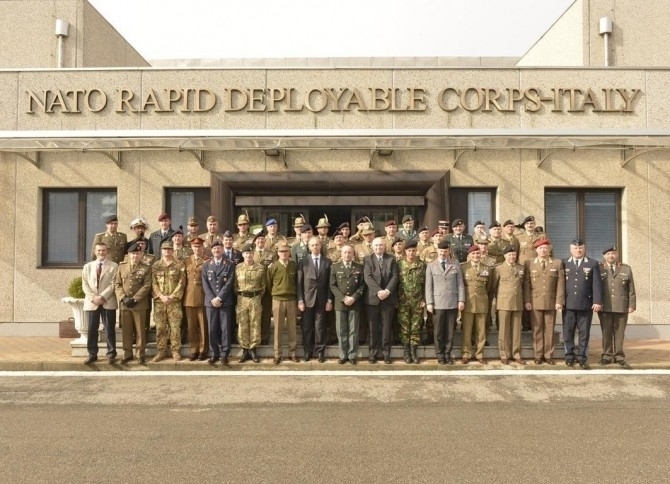 Lieutenant General Giorgio Battisti, the NRDC-ITA Commander, welcomed diplomats, academics and senior commanders to the seminar, emphasizing that consideration of technology, training and a new mentality will be of relevance to the HQ as it continues transformation into a Joint Task Force HQ. Topics of analysis included the Connected Forces Initiative (CFI), presented by Ambassador Gabriele Checchia, the Permanent Representative for Italy to NATO, who focused on the ability of the Alliance and its Partners to capitalize on the experience developed in recent operations and improving the ability to work together effectively. The audience then listened to Professor Marco Lombardi, who outlined a cognitive, comprehensive approach to cyber, which must be considered in a multidisciplinary way. Finally, Colonel Tor Hylin from the Norwegian Army discussed how SHAPE manages the challenging strategic environment, and its evolving organisation and processes. This provided NRDC-ITA staff with an enhanced understanding of their higher headquarters with the aim of reducing the conceptual distance between SACEUR and his staff. Another key element in achieving the standards required by NATO is in the area of Strategic Communication; the harmonious integration of actions and words, performed at various levels of political-diplomatic, economic and military interaction. To create the desired effects in support of policy objectives, reliable communication with key audiences and decision makers (whether neutral, friends and / or opponents), is crucial. The fundamental pillars of this process are, specifically, to “understand" the broad spectrum of all available information and the "capacity" to change the perception of the Target Audience. 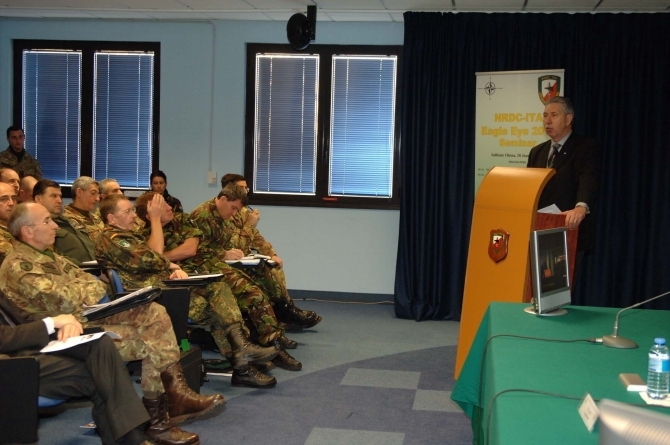 Solbiate Olona (Va), 28th January 2010 - “EAGLE EYE 2010”, a geo-strategic studies seminary, was held at the “U.MARA” barracks in Solbiate Olona, Italy, the headquarters of the NATO Rapid Deployable Corps Italy (NRDC-ITA), commanded by General Gian Marco CHIARINI.Distinguished speakers delivered lectures dealing with topics related to NATO’s role in the modern world and various possible geo-political scenarios. The presence of NATO’s Deputy General Secretary, Ambassador Claudio BISOGNIERO, one of the Alliance’s most senior figures, demonstrated the importance of the event. Ambassador BISOGNIERO opened the meeting, by highlighting the possible causes of future conflicts and the likely challenges the Alliance may have to face over the next decade and beyond. There then followed a series of lectures delivered by: Professor Massimo DE LEONARDIS, Politic Science Department‘s Director to “SACRO CUORE” University in Milan, General Carlo CABIGIOSU, the first Italian officer to take command of a NATO led multinational military force (Kosovo Force, KFOR) and Professor Andrea MARGELLETTI, president of the International Studies Center (Ce.S.I.). All lectures concerned the new role of NATO in the current geo-political environment, and on how military training must evolve and the importance of strategic communications in current asymmetric conflicts.